Veneers - Dr. Isaac Comfortes, D.D.S. Porcelain veneers are one of the most versatile and popular cosmetic dental treatments. More conservative than crowns, thin shells of porcelain can be bonded to the front of your teeth to change their shape and conceal small blemishes on the surface of your smile. Lifelike porcelain veneers have the color and reflectivity of healthy tooth enamel, and they come in a large range of shades to match your teeth. With porcelain veneers, Dr. Isaac Comfortes, in Encino, has achieved smiles of exquisite natural beauty, one patient at a time, for over 25 years. Isaac Comfortes is a highly experienced cosmetic dentist, who has taught courses to other dentists about smile makeovers with porcelain veneers. With his individualized care and attention to detail, he can provide custom veneers that are virtually identical to natural dental enamel. With proper care, you will enjoy your enhanced, youthful smile for years. 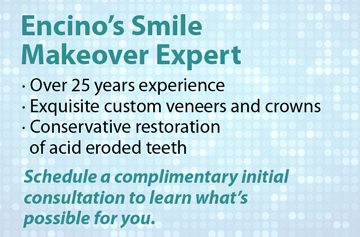 Before placing veneers, Dr. Comfortes will need to remove a very thin layer of tooth enamel. This will allow the porcelain to lie flat against your teeth. Thanks to his precision, your veneers will blend perfectly with your natural tooth and be imperceptible. After removing the thin bit of tooth enamel from the front of each tooth that will receive a veneer, we take impressions of your full dental arch and individual teeth. Our dental lab will then use these molds to design your veneers. In addition to making sure that the porcelain fits correctly, Dr. Comfortes will select the shade of porcelain that matches the natural color of your teeth. Once your veneers are fabricated and they have been delivered to our office, you will have a second appointment. After checking the fit, Dr. Comfortes will securely bond each veneer to the front of the tooth using a dental resin. Although the preparation of each tooth is minimal and you will be numbed, you might still be anxious about the procedure. Many patients experience dental anxiety, and we are prepared to make your experience calm and relaxed. 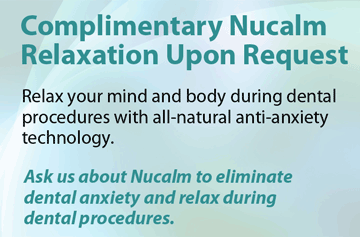 Dr. Comfortes offers the spa-like NuCalm™ relaxation system to help his patients relax in the dental chair—whether they are visiting for a dental cleaning or more. Even those who have had extensive restorative dental procedures performed, rave about the NuCalm experience and how relaxed and comfortable they were throughout their treatment. 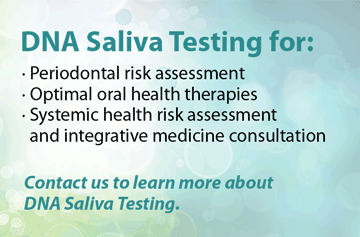 While you are waiting for your permanent veneers, we can provide temporary restorations to reduce tooth sensitivity. After you receive your final porcelain restorations, you will enjoy immediate cosmetic benefits. Many patients are surprised to find out that porcelain veneers can strengthen their teeth and last ten years or more. If a veneer becomes damaged, it can be replaced. Excellent oral hygiene, regular checkups, and regular teeth cleaning will extend the length of any veneer treatment. Dr. Comfortes has patients with longevity smiles exceeding 25 years since their veneer treatment. Acid eroded teeth can be restored conservatively with porcelain veneers. 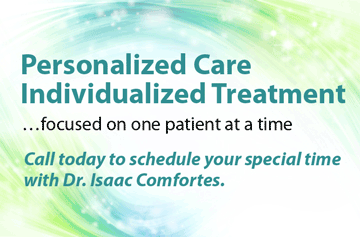 Dr. Comfortes has pioneered a conservative treatment protocol for individuals with significantly acid-eroded teeth. If you are recovering from bulimia or acid reflux disease, you can be proud of your smile and comfortably eat after this treatment that involves placing gold inlays on the backs of teeth and porcelain veneers on the front of teeth. At Total Health Dentistry of Encino, we want you to feel proud of your smile and to share it with those around you. After an oral health evaluation, Dr. Comfortes will be able to discuss the best treatment options for enhancing your special smile for the healthiest and longest lasting results. We invite you to give us a call today – (818) 990-9101.